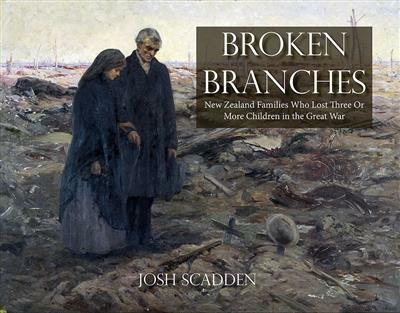 It is well known that New Zealand suffered one of the highest casualty rates, per capita, of all nations which fought during the First World War. The tragedy of this conflict is compounded when an analysis of the losses suffered by individual families is undertaken. Dunedin autho... read full description below. It is well known that New Zealand suffered one of the highest casualty rates, per capita, of all nations which fought during the First World War. The tragedy of this conflict is compounded when an analysis of the losses suffered by individual families is undertaken. Dunedin author Josh Scadden has completed research in to all those New Zealand families who lost three or more siblings to the conflict, and the result is this book - Broken Branches. 71 families are represented in this publication. Their origins, lives before the war and ultimate fates are covered in detail, together with numerous photos. It presents a sobering memorial to those families who endured the ultimate sacrifice on multiple occasions.